Apple will likely launch a new high-definition television set in March 2012 with three screen sizes and price points, one Wall Street analyst claims. Trip Chowdhry with Global Equities Research issued a note to investors on Sunday in which he shared his "converged view" on an anticipated Apple HDTV, with information based on details culled from a number of developer events he attended. Chowdhry said the product that is most similar to Apple's rumored HDTV is the Bose VideoWave, a 46-inch LCD HDTV with an integrated surround-sound speaker system. 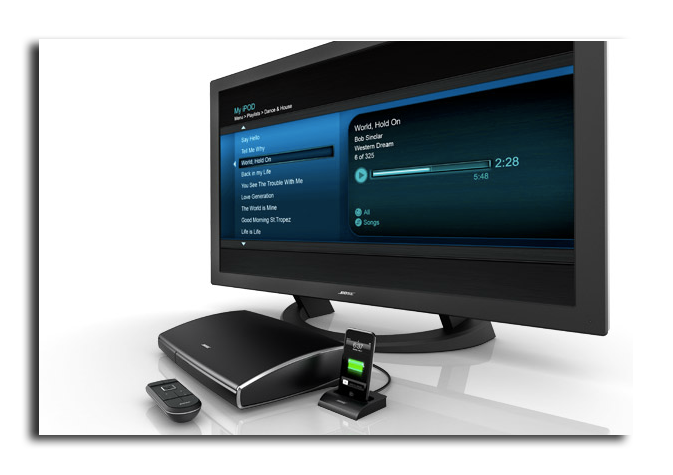 The VideoWave aims to simplify HDTVs by reducing clutter, and to improve picture and sound quality. The Bose VideoWave gives the greatest sense of where Apple's alleged HDTV may be heading, Chowdhry claimed. He said his "converged view" of data from various developers is "probably" 75 percent accurate, and that it will "probably" be launched in March of 2012, with developer sessions at the Worldwide Developers Conference in June. Apple's rumored HDTV is apparently being benchmarked against the VideoWave because it has reduced its number of cables to just three. Chowdhry believes that any television set from Apple would have just one cable. The VideoWave also sports a thickness of six inches, packing in 16 speakers. Chowdhry said that Apple's purported HDTV will be a third as thick and will also have 16 speakers. "These 16 built-in speakers gives a complete surround sound experience, without the need for any external speakers," he said. Bose's HDTV product comes in just one screen size and price point: 46 inches for $5,200. Chowdhry said that an HDTV from Apple will have three screen sizes and three price points. "The DSP chip in Apple HDTV is a brand new chip based on Apple's acquisition of PA Semi," he added. "As of now, this new chip is not in mass production." Claims of a forthcoming Apple-branded Internet-connected HDTV are not new, and one report from April even suggested that Apple could release its own television set this year. One analysis issued earlier this month found that Apple's market capitalization could grow by $100 billion if it were to enter the HDTV market.